Boxed gang of Bushrangers including special rules card and bases. Models supplied unpainted. The Bushrangers are some of the meanest types you're ever likely to cross. They've left the world behind and taken up a life of crime. Living in the most desperate parts of the land they feel they are out of reach of the law and society at large. This distance from others has taken it's toll on any moral values they once may have had. 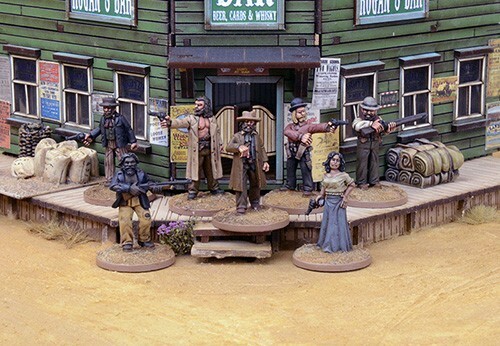 For them life is cheap and best lived fast and wild.This box set contains 7 Bushranger figures, bases and Bushranger rules card, all you need to play Dead Man's Hand. Sculpted by Mark Evans.